Frank. Fearless. 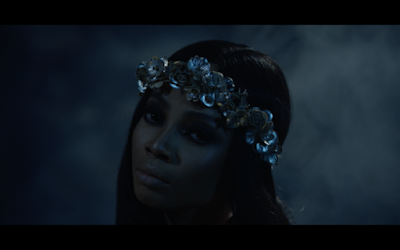 Formidable…Just a few words that spring to mind as we watch Toke Makinwa in her newly released ‘On Becoming’ visuals. The big reveal coincides with Toke’s birthday today and sparks conversation about what she is ‘Becoming’? Directed by Kemi Adetiba, On Becoming is a graceful yet haunting 3-minute clip shot in a pitch-black room. Suddenly we hear the strike of a match which reveals a hand lighting a candle. The Candle is lifted to illuminate a wall plastered with salacious newspaper headlines. Toke is then seen standing and brushing her hair in stoic fashion, without emotion on her face. This new material showcases a mysterious side of the media personality as it expresses unspoken emotions and brings to light a side of Toke Makinwa that we are yet to experience.